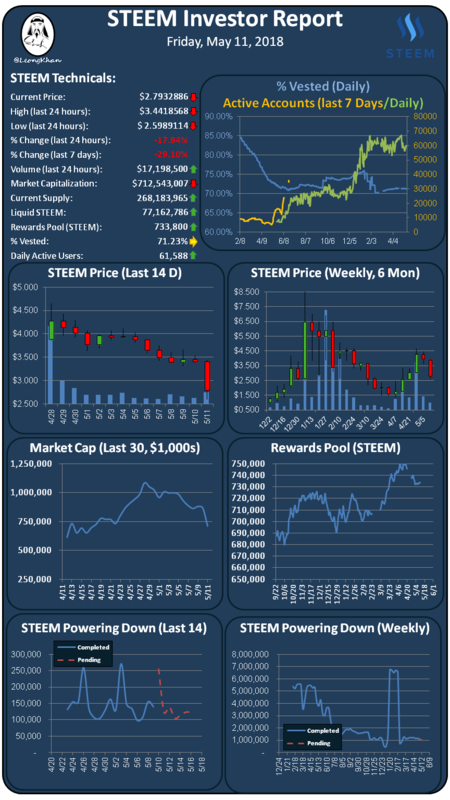 The STEEM price is down 17.94% verse the USD over the past 24 hours on higher volume ($17,198,500) as Bitcoin is down sharply at $8.8k and the broader market appears to be panic selling many cryptos. STEEM is down significantly verse Bitcoin as Korean trading appears to be leading the panic selling with 50% of the trading volume. The overselling of STEEM and many other cryptos looks like a great buying opportunity once they settle out in the next day or two. New account creation has spiked up even further to 11,000 new accounts created in the past 24 hours as Steemit may be catching up on the new account backlog. The % vested indicator is flat at 71.23% on steady power downs and a break in power ups. Daily active accounts is up to 61,588 accounts executing transactions over the past 24 hours. SBD is at $2.29 on Bittrex which is still very elevated over the peg, receive you rewards in 50% SBD and then use the SBDs to buy STEEM on the exchange. SBD conversions are a waste of money again! Good that we have lots of new accounts. I hope they are real people and not the fake ones I've heard about previously. Steemit needs more active users. That will drive the price up as more want to use it.